After more than a year, it's great to revive this blog! This afternoon I came across these fun pumpkins. Look closely at the photo ... is that a turtle perched in the center of the birdbath? Note: This is the first installment in a blurb-series. This is my own original work of fiction. Guide => someone who shows another “the way”. Few road trips start with a visit to a cemetery…or a battlefield for that matter. However, Meg knew the Little Bighorn Battlefield would be of interest to her clients. The day began with an early start. Driving at dawn along the winding county road, she suddenly stomped on the brakes, narrowly missing the fox. At first glimpse the creature looked like an overgrown cat. Then as the approaching headlights illuminated two piercing eyes, the fox stood froze in the middle of the road just long enough to give Meg a scare. Her heart racing, she slowly reached for the stereo knob and dialed down the volume. By now the fox had trotted to the side of the road and stood staring at the idling vehicle. Meg turned her gaze directly toward this curious creature as she lowered the side window. Continuing down the road, Meg’s thoughts focused on the Fox and its medicine. Lurking within a small subset of humanity is the league of mommie mountaineers. Some of us reach celebrity status such as Arlen Blum or the late Julie Tullis. Us moms squeeze in a whole lotta living into our waking hours. Some of us work an office gig, while others dabble in the outdoor industry. We weave family time right next to workout time. New Mexico has always held a special place in my heart. It’s the birthplace of my daughter, where I bought my first home and the land of many adventures. During the off-season, I took some down time to road trip with Alison throughout the northern mountains. A must see for anyone visiting the area is Taos Pueblo. Ceremonial days are more interesting than visiting at other times of the year. Be sure to check out the tribe’s calendar and visiting hours for details. My personal favorites are San Geronimo Day and the Deer Dances. Any tour to Taos should also include a stop at the Millicent Rogers Museum. The collections intrigued and entertained us, especially the textiles, large garden sculpture and unique jewelry exhibits. To round out our time we included a mini-tour to Chimayo to see the Santuario de Chimayo. Regardless of your spiritual background, this enclave will touch you deeply. The path leading up to the church is lined with rosaries, candles and offerings for prayers. Once inside the original chapel, we were overwhelmed with the abundance of artifacts, photos, and pleas for blessings that completely cover the walls. *All photos for this blog entry are courtesy Alison Salva. When you use any photos from this blog, please list proper photo credit. My life's been a whirlwind of activity and travel for the past two months. Here's a rough cut of some campusing footage I captured during one of the Boulder Rock Club's campusing clinics. On Saturday, under partly cloudy skies, Tim and I got a leisurely start leaving the Lumpy trailhead after 8am. The hike out to Sundance Buttress is rather long (for craggin’), yet well worth the effort. We arrived at the base of Sidetrack in 90 minutes. By then, the thin veil of clouds dissipated revealing blue skies. Using a standard trad rack, we ascended the towering buttress for 6 pitches of awesome crack climbing. There were two parties on Mainliner (next to us) and one party waiting to climb Sidetrack after us. My favorite part of the climb was the last pitch of 5.9. It was absolutely wonderful! 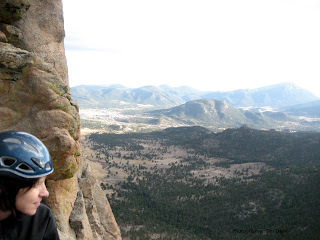 For a complete route description and climber comments, see the Mountain Project web site. Over the weekend, Alison and I met up with Bob Dawson, Dwight Sunwall, Scott Nichols, Steve Cassin, and Sharon Adams in the Lost Creek Wilderness. They were poised for a Sunday ascent of McCurdy Tower and Peak 11328. Alison and I were more interested in exploring the stellar rock piles near the Twin Eagles Trailhead. Our adventure began Saturday evening with delightful conversation while roasting marshmallows over a roaring campfire. It didn’t take long for the fire-talk to turn into a full-blown trip planning session. Before long we were plotting new adventures. Sooner rather than later, we turned in for a restful night of sleep. On Sunday, the crew rose at first light and headed out for their summits. Alison and I slept in until 9am! After sharing details of our surreal dreams, we rose and cooked a hearty breakfast. There’s something about cooking outdoors that brings out a renewed appreciation of food-as-fuel for our bodies. After breakfast we eyed some sweet granite rock piles. I’ve been impressed with the quality of rock in the Lost Creek Wilderness. Stellar granite makes for fun scrambling and bouldering. We focused on one rock pile in particular and named it “Breakfast Rock”. We spent a couple hours ascending silly-fun lines of varying grades, all the way up to V0+. 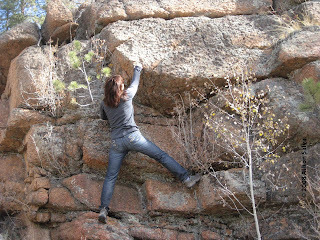 My favorite line was a bouldering problem I dubbed “Up and Over”. Enjoy the fall weather and have a great week all!